Lisa Taafe, clinical administrative director, leads the Transition Steering Committee, which is coordinating the opening of the new building on the Beeghly campus. 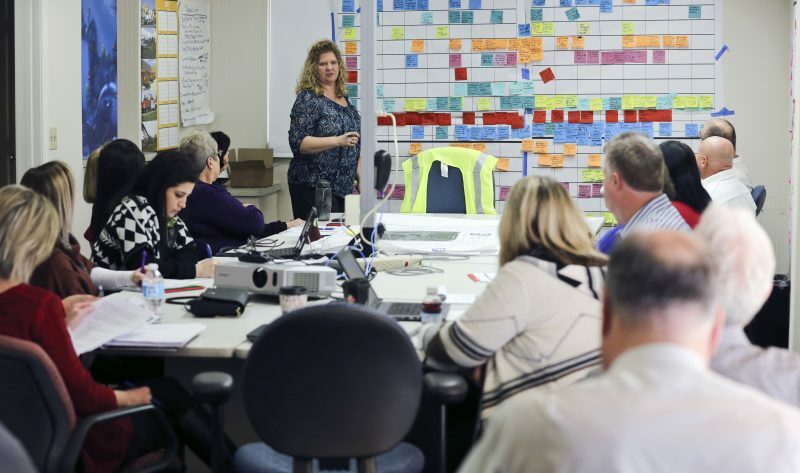 While the cranes, bulldozers, cement mixers, contractor vans and hard-hatted men and women diligently plug away at constructing the $20 million Beeghly campus expansion building structure, a group of 25 service line managers meet in a “war room” nearby to plan out the details. The Transition Steering Committee, chaired by Lisa Taafe, meets every 1-2 weeks to coordinate all the needs of the ancillary services involved in operationalizing the new space. Literally every detail, from determining needed supply inventories to ordering furniture and arranging for staffing needs. To track and organize everything, Lean Six Sigma Deployment Leader Sherry Valentine introduced a planning method called “pull planning,” which allows the team to plot their work in milestones. The same method was used in the construction of the Kay Jewelers Pavilion in Akron, which opened in the spring of 2015. 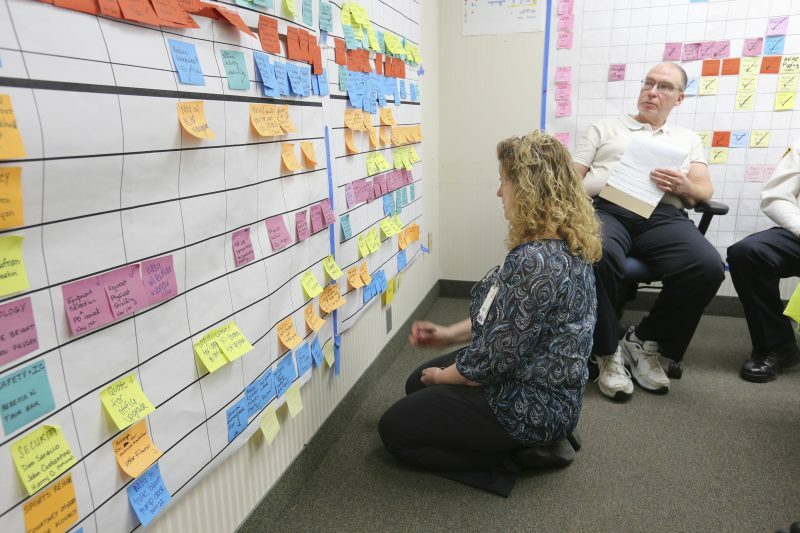 Pull planning starts with a highly visible wall chart with specifically colored sticky notes. Pull planning starts with a highly visible wall chart sectioned in columns and rows, each with a specific meaning. The Y-axis holds “swim lanes” with one belonging to each department involved. The X-axis is used for dates in a timeline leading to the turnover date of the project. 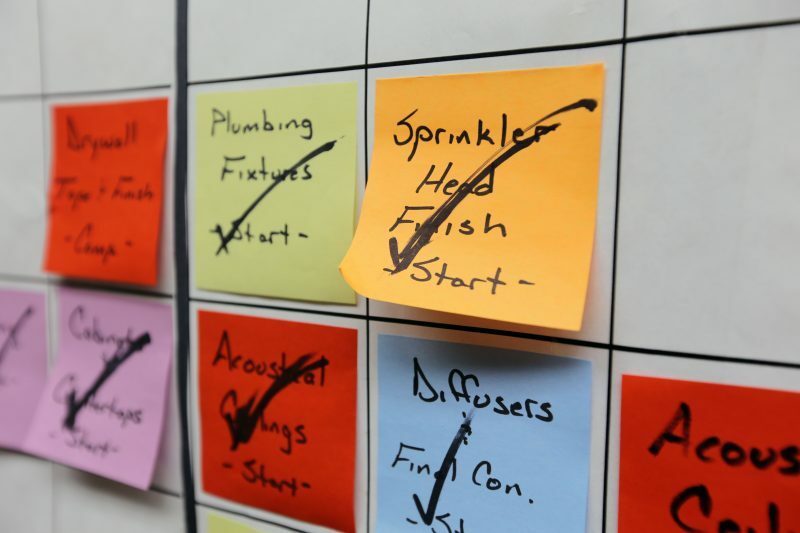 Taafe added that the team identifies what needs to be done week-by-week, and at each milestone a specifically colored sticky note goes on that date. The meetings are used for reporting out; not for doing the work, she said. “One change on a swim lane can affect another service line’s timeline, so that’s why everyone is in the room,” Taafe said. The committee is working toward a move-in date of Fri., July 7. Moving will take place over that weekend ahead of a dry run dress rehearsal complete with trial patients on Mon., July 10. The building is slated to open for patients July 11. Follow the progress on this construction camera. Lisa Taafe adjusts some notes on bottom portion of the board.